After the recent success of the W1AW/4 SC operation (30,000 QSO’s, 26 operators, all modes), we are now in preparation for the 2014 South Carolina QSO Party. The W1AW/4 SC event proved that South Carolina is a wanted commodity in both the DX world and in the WAS and County hunts. It also proved that South Carolina has very accomplished DX’ers and Contesters. Based on last year’s statistics and the amateur radio operator counts, we have several counties that are rare commodities and just waiting for rover stations to hand out Qs. Allendale, McCormick and Williamsburg are just three of the counties with less than 50 hams and are on the high priority list for county hunters. 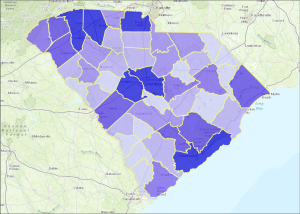 The actual county/operator counts can be found on the SC Counties Page. 2013 was a great success surpassing 2012 both in the number of operators, rover stations and QSO counts. 44 out of 46 counties activated and two rover stations running 1,200 Qs combined. If you are planning on participating as a rover, it would help to get your effort announced at the following URL. Some helpful hints – while you can’t self-announce on the various clusters, there is nothing to prevent you from announcing other hams on the air from SC. There is also nothing to prevent you when contacting another SC station (and that will happen – SC county hunters need SC too) – ask for a cluster spot. Be sure to thank the other operator for the Q. Take your time if you aren’t used to the hurly burly of contesting. If you work CW, don’t forget the TECH bands on 10 and 40 – I speak from personal experience as a lot of my Qs on 10 meters were in the TECH band. Try to keep the speed down too – I found that 17 wpm was a good pace and easily understandable even for those who aren’t CW oriented.